Kubo Mitsurou talks Yuri!!! on ICE’s ending on the radio show! And needless to say, there are SPOILERS under this cut! Toyonaga (Toshi) and Uchiyama (Ucchi) start off talking briefly about the series. About how the time seemed to fly, and about how long the recording sessions were. And how you’re still learning something new in the final episode. And of course, about how Yurio won (Toshi: Congrats! But so damned frustrating!) And then they finally welcome Kubo-sensei onto the radio, and she makes quite an entrance, as you’d expect of a radio pro (she used to host the All Night Nippon radio, a few years back). Since she’s been listening to Yuri!!! on RADIO, she’s very happy to finally be the guest. Then they get to talking about the finale. Kubo: In the GPF, Yurio gets the world record for the short program, whilst Yuri gets the record for the free. And of course, these are both personal bests for them. But the world record for the total score is still Victor’s. Toshi: So Yūri and Yurio each surpass Victor in one program, but they still have to chase him on the total score. Ucchi then brings up how they received the ‘names’ (manga storyboards)2 that Kubo-sensei drew, an experience that’s unusual for anime, which were really long. She notes that they just got longer and longer. Like, at first, they were about 70 pages long, but the final episode was something like 120-130 pages long… They just had so many things they wanted to include, but even then, there was just way too much stuff! So the people in charge of the animation storyboards basically had to cut the material down into something that would fit into the standard episode running time. Toshi: I wonder just how much work and time it would have taken to do that, like, these discussions about “series composition,” the script meetings. That process, like, going from the names to the storyboards/animation, was that basically done by director Yamamoto? The two seiyuu didn’t really interact with the director during recording etc, so they wonder what she’s like. To them, she came across as a rather taciturn/quiet person. Ucchi: Were the two of you always this close? Ucchi and Toshi: “As if something just leaked out!” “That gorgeous person going “DOHOho!”? Ucchi: That’s amazing, like whoa! Ucchi: Like, you can trust her! Ucchi: You’d get really into it and so you’d eat? Ucchi: You mean the skater Johnny Weir? Kubo: Yup! So I’d be like “Hey, Johnny’s watching! Let’s reply to him!” Like, just filled with emotion, we’d do it in Japanese. Kubo: Right right! Back to Director Yamamoto, though, she’s someone who really loves figure skating, and anime as well. So my role was to capture that love in the ‘names’ and convey it to everyone else. For myself, I’m really glad to have had the opportunity to work with her on this, and also that the details that she was particular about have been conveyed to the viewers. And they’ve run out of time for this segment (because Kubo-sensei really talks A LOT! 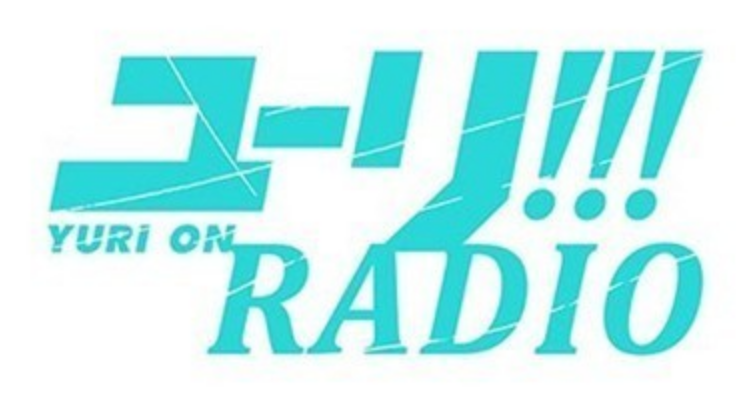 ), so they put on the “Yuri on ICE” music before moving on to the next section of the radio. Why did you give Yūri’s hometown the fake name of Hasetsu? Kubo-sensei has set a lot of her stories in Kyushu—she herself is from Sasebo. But there were two reasons. First, if they chose a place that’s famous for producing a lot of figure skaters, like Nagoya prefecture, Okayama, Kansai and even Tokyo, then viewers would assume that there’s a particular model (the location and the figure skaters)—for example, it might cause them a range of problems, like of distrust etc. Kubo: The other reason is that Yuri’s home town isn’t exactly doing well—like, it’s a rural little area where “Katsuki Yuri is our town’s one beacon of hope!” But with that kind of setting, if you use a real town, then it’s like you’re saying bad things about that town, giving it a negative image. So we gave it the name of Hasetsu, and the rink is meant to be something that might appear in any other town that decides to build one in the future etc. But then, we thought that a town that sits under a castle would leave more of an impression on foreigners, so somewhere in Kyushu, a place with a castle, but one that hasn’t really drawn much attention as a tourist location…and that’s how we chose Karatsu. It’s also a place and a castle that’s not really that famous, there’s not much material on it (unless you go to visit). And the people (officials) of Karatsu were also pleased at the link up. We also asked Saga film commission for cooperation, but after the anime became a hit, they also helped us a lot with promoting the show down there. So we’re really thankful for that. Toshi then asks if there were characters that were easy or difficult to write. Kubo: JJ was really easy. Toshi: Because he just moves of his own accord? Kubo: Like, the lines of his monologue when he’s skating. We had his character set by the time of the audition and who was perfect for the role, well, we decided on Miyano-san. But his lines just kept flowing out, like, “JJ would say this kind of thing!” But the thing is, if top athletes don’t say that kind of thing, then they wouldn’t leave a lasting impression(?). 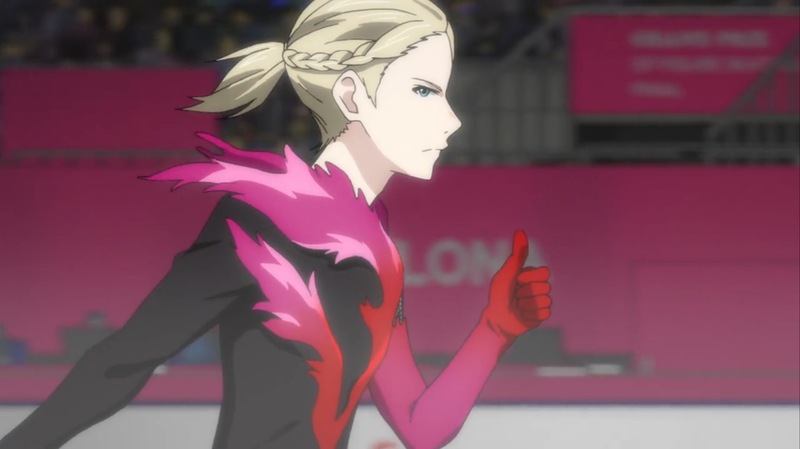 But Yurio was also really easy to write—his appearance was the first one that we came up with. But when we thought about making him the centre of the story, he didn’t really pull weight in terms of getting the story moving. 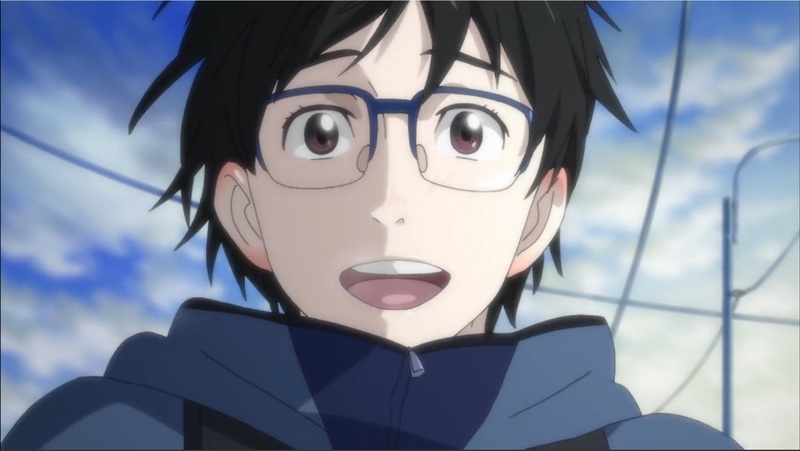 Someone like Yuri, who has some kind of weakness about him, like, that tendency to pull back; as a set with the character of Victor, Katsuki Yuri really got the story moving. 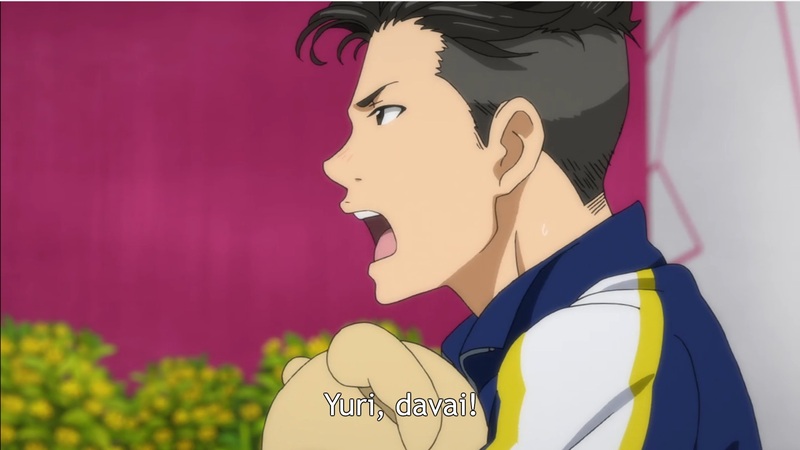 We felt that so many times as we were writing, so we really were saved by Yuri in that sense. “Let’s do this, but he just wouldn’t budge.” I talk about it a bit more in the interview in the DVD/BD booklet. Like, Yurio’s got a bit of tragedy behind him, so if the story had been about him, then it would have been easy for it to head in a sad direction. We didn’t want to do that, we wanted the story to be something full of love, and that’s why we made it into the anime that it is. Toshi: But Yurio’s relationship with his grandfather is, like, really warm. Kubo: It is. We didn’t really go that deep into his family…it’s because we didn’t really want to make what he lacked into a handicap. 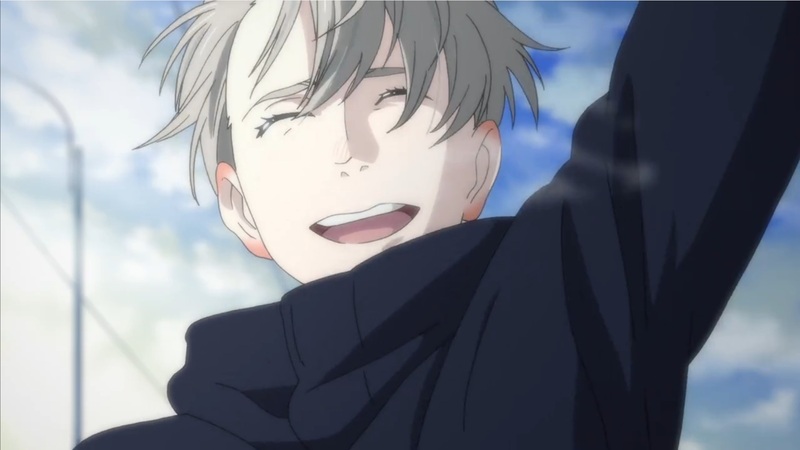 And through meeting Katsuki Yuri and becoming separated from Victor, with Yakov and Lilia, his grandfather, and then later on, his new friend Otabek (“his first friend!” laughter)…there, you can see that there are people who will help him out from here on, and we wanted to leave it at that. We really wanted to write more about Otabek and Yurio, but we just didn’t have the time, especially with that final episode. And that’s all that we have from any of the creators about the ending to YOI for now…expect the next busload of information to drop in a couple of days, when Spoon 2Di comes out. And then another truckload will come out on January 10 (Animage, Animedia, Pash! etc). Unfortunately, whilst I’ve put an order in for those magazines, unless I decide to cancel and reorder the BD box set that’s coming out at the end of March, I won’t be getting them until then… I’ll see if there’s anything else I can do, but I’m making no guarantees at this point. In the meantime, I’m going to try and get through the huge backlog of interviews that has been built up because of my recent YOI obsession. There are a few more YOI interviews in there, of course, but there are several other series I’ve been dying to cover as well! 10 Responses to Kubo Mitsurou talks Yuri!!! on ICE’s ending on the radio show! Yamamoto Sayo is hot and pretty, daaaang, slay mama! I had no idea Johnny and them ended up tweeting each other aawwww! And same — I honestly wish they’d somehow managed to secure a double-length final episode, if only so that we could have seen full free skates for all 6 competitors! There’s been a lot of interaction between the real figure skating world and the show’s creators. Stéphane Lambiel was a late-ish addition to the last episode as well, I think. And you’re welcome! Glad you enjoyed it! Haha, that’s understandable, don’t sweat it!